A one-two punch system for knocking shine and clarity back into your clear plastic components! Thank goodness for surface care experts such as the good folks over at Meguiar’s! If you’re the proud owner of a rag top with clear plastic windows, you’ll be thrilled after just one application of Meguiar’s Plastic Care Combo. Clear, bright, supple and glass-like are the words to describe how your plastic will look. Sure, lots of products out there clean clear plastics, but Meguiar’s knows it takes more than just cleaning--plastics need to be polished, just like paint, in order to maintain clarity. I would like to give a word of caution to anyone cleaning a convertible top window--make sure you choose wisely before you apply anything to the window. Rag top windows are a soft, supple clear plastic. If you mistakenly use a cleaner that is too harsh, it could cloud, haze and permanently damage the surface of the plastic. Not a good thing! That is what makes Meguiar’s Plastic Care duo so priceless. 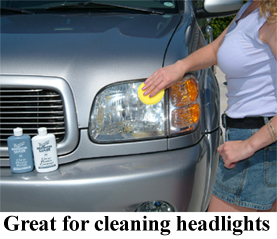 These two products, #10 Plastic Polish and #17 Plastic Cleaner, are intended for a tremendous variety of uses. They are commonly used on clear plastics in boats, airplanes, and automobiles, as well as dozens of household and professional uses. #17 Plastic Cleaner is the cleaner component of this combination. It safely and effectively gets the grime off the surface and pulls the dirt out of tiny hairline scratches, leading the way for #10 Plastic Polish to add the finishing touches. It is an outstanding polish for all clear plastics--even the soft variety. The crystal-clear fillers in the polish fill in and round the edges of minor imperfections so that they seem to disappear. You’ll never get a haze with either product. The level of clarity that you will achieve with Meguiar’s Plastic Care Combo is unmatched. Sure, you can purchase just the cleaner (#17) or the polish (#10) alone, but it just doesn’t make sense! Proper maintenance for plastic requires that these two steps be done hand-in-hand. I’ve put together a convenient kit, the Meguiar’s Plastic Care Kit, to save you money and provide you with the appropriate tools to care for your plastic. Regular use and proper maintenance of your plastics keeps them looking great for years to come. Without regular maintenance, plastics grow dingy, yellowed, and clouded. And for convertible tops the effects are far more than just cosmetic. When cared for and regularly conditioned, as with the polish, you greatly extend the usability and life of your convertible top windows (not to mention visual clarity when you drive.) 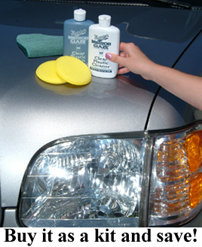 The Meguiar’s Plastic Care regiment applies with ease and delivers an amazing gleam and crispness to all plastics. Try the combination for yourself and see if you’re not convinced of their merit as “must have” products! 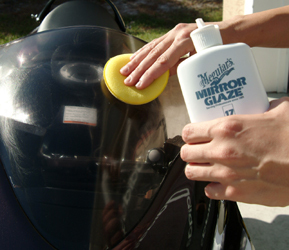 Get the most out of your Meguiar’s #17 and #10 by applying them with Mother’s PowerBall. The professional grade foam tabs are perfect for restoring clarity to hazy plastic. Use the PowerBall with your drill or polisher to remove fine scratches, yellowing, stains, and haze from clear plastic convertible top windows, motorcycle windscreens, boat windshields and portholes, and headlight lens covers. Each is an 8 oz. bottle.